Cars and deer can be a lethal combination. Deer migration generally runs from October through December, and causes a dramatic increase in the movement of the deer population. As a result,more deer-vehicle collisions occur in this period than at any other time of year, so drivers need to be especially cautious, according to the Insurance Information Institute (I.I.I.). Deer are unpredictable, especially when faced with glaring headlights, blowing horns and fast moving vehicles. They often dart into traffic. Deer often move in groups. If you see one, there are likely to be more in the vicinity. Always wear your seat belt. IIHS reports that in a study of fatal animal crashes, 60 percent of people killed were not wearing a seatbelt. Sixty-five percent of people killed riding motorcycles were not wearing a helmet. Do not rely on devices such as deer whistles, deer fences and reflectors to deter deer. These devices have not been proven effective. 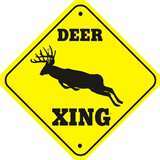 In the event your vehicle strikes a deer, try to avoid going near or touching the animal. A frightened and wounded deer can hurt you or further injure itself, warned the I.I.I. If the deer is blocking the roadway and poses a danger to other motorists, you should call the police immediately. Contact your insurance agent or company representative as quickly as possible to report any damage to your car. Collision with a deer or other animals is covered under the comprehensive portion of your automobile policy. Contact the LEE ANN MILLER TEAM to help you contact an insurance agent today! This entry was posted in Belmont - NC, Buyers, Cabarrus County - NC, Charlotte - NC, Concord - NC, Cornelius - NC, Davidson - NC, Denver - NC, Denver - West Norman, Fort Mill - SC, Gaffney - SC, Gaston County - NC, Gastonia - NC, Hickory - NC, Huntersville - NC, Iredell County - NC, Kannapolis - NC, Lake Living - Lake Norman - NC, Lake Living - Lake Wylie - SC, Lake Living - Mtn Island Lake - NC, Lee Ann Miller Team, Lincoln County - NC, Lincolnton - NC, Mooresville - NC, Mount Holly - NC, North Carolina, Pineville - NC, Real Estate - Buyers, Real Estate - Sellers, Relocation, Rock Hill - SC, Sellers, South Carolina, Statesville - NC, Troutman - NC, University City - NC, Weddington - NC and tagged deer, deer-vehicle collisions, Insurance Information Institute, Insurance Tips, Lee Ann Miller Team by Lee Ann Miller. Bookmark the permalink.